CHARLES CITY – The best shopping day of the year in Charles City just got even better. The ChickFest retail event has become a spring tradition, offering a special shopping experience that includes deals, discounts, demonstrations, pampering, free gifts and showcases Charles City’s varied and unique retail offerings. It has become the biggest shopping day of the year for many merchants, and is coming up again on Saturday, April 6. Two new offerings have been added to the latest version of ChickFest. The first is a chance to score a free gift or discount at one of the participating businesses by finding a Golden Ticket in one of the 150 gift bags to be given out beginning at 9 a.m. at the Charles City Area Chamber of Commerce. The first 150 shoppers in line and through the door at 401 North Main St. will receive a bag with assorted promotions from participating businesses. A number of those bags will also contain the special Golden Tickets, randomly distributed, for your additional shopping pleasure. The second addition to ChickFest this year will be horse-drawn carriage rides by Top Hat Carriage Service. Loading at Central Park, across from the Chamber on Blunt Street, the rides around downtown will be offered on a free-will donation basis to promote and support a new non-profit called Magdalene’s Light. It is a residential and vocational program being established at Cedar Springs Camp near Floyd for abused and trafficked women. In addition to the regular shopping options, ChickFest will also include indoor Farmers Market vendors and in-home businesses set up around town. 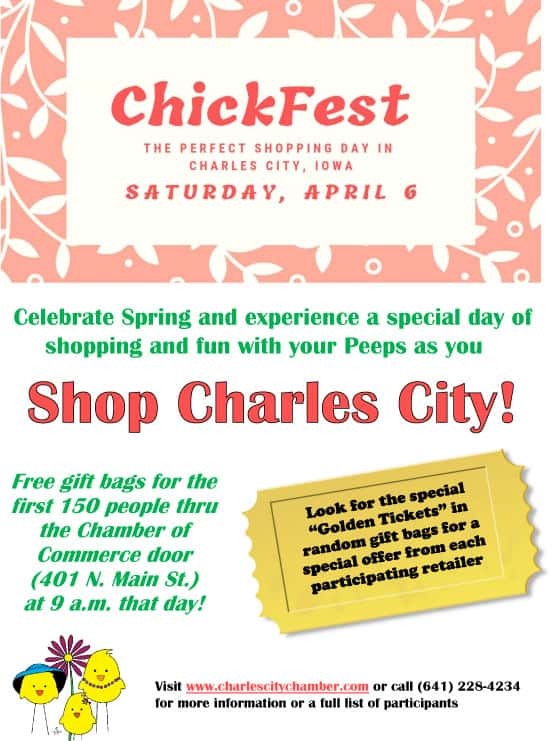 Whether it’s a girls day out or a family excursion, come celebrate spring with your “peeps” and enjoy what Charles City has to offer. For more information on ChickFest and the community’s other attractions, visit www.charlescitychamber.com, call (641) 228-4234 or email info@charlescitychamber.com.